I discovered yesterday that my grandmother is moving out of her house that’s she’s lived in forever (ever since I’ve been on earth). She seems ok with the move actually. She realizes she is getting older and needs more assistance than she used to. Also, the upkeep on her place is getting hard for her to do. 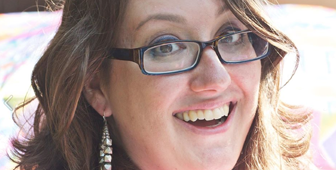 She recently had to pour a lot of money into a new furnace and air conditioner. And the move will be easier on her and my folks. She’s going to live just below them on their property. I guess the whole thing about it is that with her changing locations, I realize a lot of things about myself…that I must face the inevitable…death of her, death of my family, death of myself. And that things are changing around me whether I like them or not. 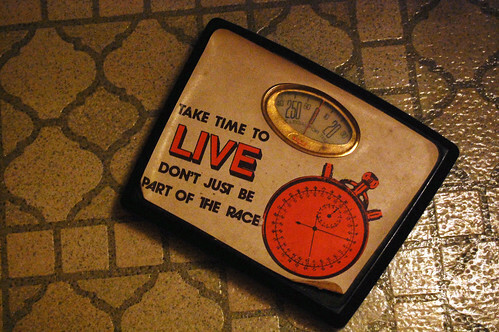 Life just evolves like that. I just always liked the feeling I had when I went to her house and enjoyed my memories there. I think it makes me sad to know that a lot of those days are behind me. It’s not to say that good, new memories aren’t ahead of me and that my life, too, will evolve…it’s just hard saying goodbye to phases/things/loved ones and the reality that goes with it. The last few times I visited her, I took a few pictures here and there of her place. I knew that it was only a matter of time before things would change and I wanted to have those memories documented…here’s just a few of my favorite things from her house that I cherished and loved about it. 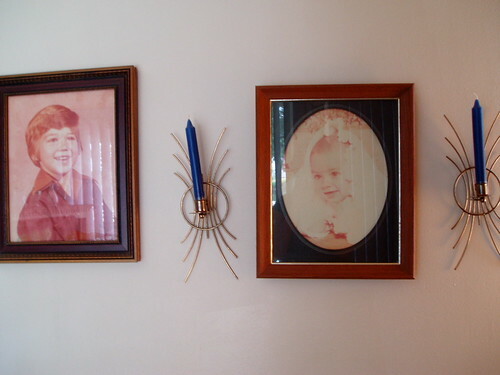 Faded portraits on the wall…that’s me on the right and my big brother Charles on the left. Here’s the scale in her bathroom. I always liked it even as a kid…prob. cause of the retro graphic. 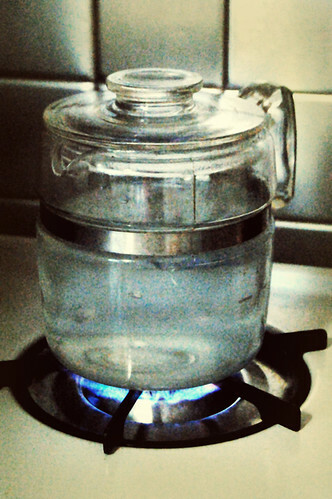 Here’s her percolater and her stainless steel backsplash. 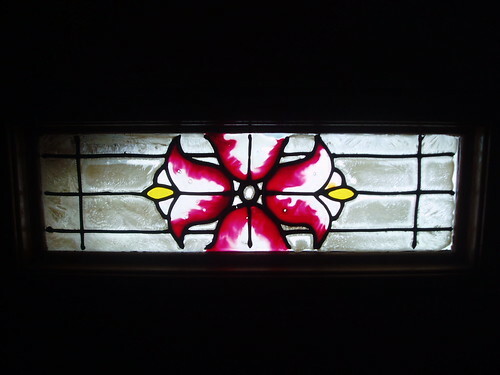 Here’s a detail of her Stained Glass window on her front door. 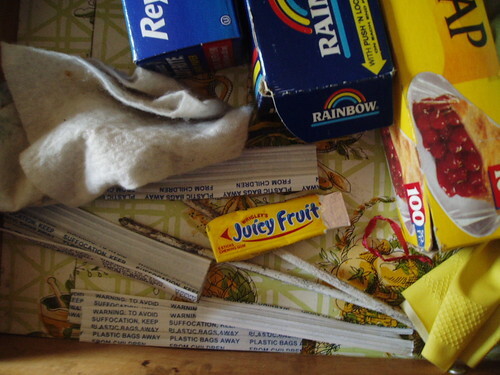 Her junk drawer…always with Juicy Fruit waiting just for me and my brother!! 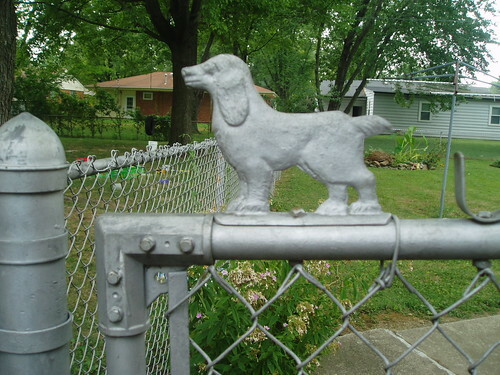 I always loved that dog on that chain link fence gate. Be glad you took pictures. My grandma moved out of her place a few years ago and my mom ended up buying it from the family (that’s a twisted story in itself). While the house is the same because it’s still on the same farm, still the same yard, etc, my mom is starting to update it. It’s great to have a new kitchen there, but it was very sad to see the old one go. I love looking at the old pictures with the old stuff in it. I agree. My friend’s granny moved out of her house and in with her parents and now her brother is renovating it and living there. They are making drastic changes. I almost think I would want to remember it the way it was. I don’t think I would want to be the one to fix it up and make all those changes.